I have to confess to finding Facebook quite useful and interesting but I don’t know what Tory Historian would think of that. The friends and contacts one makes are more varied and, above all, further flung in the world than they would be in the ordinary course of existence. After all, is it any different from those correspondences so dear to the heart of all intellectuals and wannabe intellectuals of the eighteenth and nineteenth century? Or the pen-pals of one’s youth? Then there is all the information other people have found out and posted as their status update: all one needs to do is to follow it up. That is what I did with the poster reproduced above. Produced in 1909, it showed very graphically what the Conservative Party wanted people to think of socialism. My first reaction was a slight surprise: did the Conservatives view the Labour Party in 1909 as the primary enemy? Surely not. It was not even clear that the upstart movement would get anywhere far in British politics, let alone become one of the two leading parties. In the Lib-Lab pact of 1906, Labour was the junior partner. Somebody (also on Facebook) suggested that perhaps it was fear of ideas and immigrants coming in from Russia. Hmmm. Those immigrants were not in a position to strangle prosperity in Britain. There was nothing for it but to trace matters back. First of all, through the Conservative Party Archives, I found an excellent source of material, to wit a collection of political posters. One could spend many hours looking at these and working out the details. Generously but also sensibly the posters are available for downloading and reproduction, as long as it is not done for commercial purposes and proper accreditation is given. I can safely say that no commercial benefit accrues to me from this or any other blog and I always give proper accreditation. As does Tory Historian. Radical threats have always galvanised Conservatives to mobilise support through the best means available at the time. The great reforming Liberal administration of Asquith and Lloyd George after 1906 provided one such challenge, with the defeated Conservative Party entering one of its most fratricidal periods in opposition, the new ‘legion of leagues’ spared no time in spreading their message to the electorate through a concerted campaign of leafleting and billboard posters. The Budget Protest League thus waged a fierce war of words against Lloyd George’s far-reaching 1909 budget, as well as launching a series of soften witty cartoon posters. That is not a particularly well written paragraph but the gist of it is clear. In response to the 1909 budget, which was remarkably similar to suggestions made by the Labour politician, Philip Snowden, the Conservatives or, at least, activists who were clear-sighted enough to form the Budget Protest League, launched a ferocious but very clever attack on what they saw as the beginning of socialism in Britain. And who is to say they were wrong? The campaign was not altogether unsuccessful as the Conservatives, catastrophically defeated in 1906, recovered a good deal of their support in the two 1910 elections but the King’s death and the subsequent fight over the House of Lords rather than the implications of higher taxation and redistribution turned the political process against them. To this day it is a rare historian who wonders whether those opponents of the “great reforming administration” might not have had a point. Then again, it was a Conservative government under Balfour that abolished school boards, replacing them with the Local Education Authorities in 1902. And we have never looked back. This was Open House week-end in London, a very worthwhile enterprise that appears to be losing some momentum, getting bogged down in badly written prose and trendy jargon like sustainability (meaningless in the context) as well as self-congratulation. The programme this year was thinner than ever before with many much loved buildings missing and whole boroughs opting out. Nevertheless, Tory Historian found two fascinating buildings, neither seen before and both, as it happens, related to Victorian self-improvement. One was the German Gymnasium, opposite the glorious new St Pancras International station, which was staffed by Open House volunteers who had not bothered to find out anything about the building. In fact, the Q&A leaflet that was lying on the table had several questions that were not provided with answers, merely with blather. However, the history of the Gymnasium, probably the first of its kind in Britain is fascinating, as is the building with its vaulted roof of laminated timber trusses that was copied for the original King’s Cross station. Though there have been additions, such as a platform built as a first floor in 1908, essentially the building is there as it was first built in 1864-5. The money was raised by the German community in London (something that the Open House team seems to find “impressive”, which would indicate that their knowledge of Victorian mores is not very good). In the first place the facility was for the German Gymnastics Society, which had very advanced ideas on the need for physical exercise for both men and women; there are illustrations of those various exercises on the wall. Needless to say there was also a well stocked library (what happened to it, one wonders) and literary evenings were held. Soon after its opening membership was extended to all nationalities and, apparently, the records are still available – they provide interesting information about all those various nationalities to be found in London at the time. Due to the work of one of its early presidents, Ernst Ravenstein, the building also claims a pivotal role in the birth of the modern Olympics, and in 1866 the German Gymnasium hosted the indoor events of the first National Olympic Games. Amazing: all done on private money and as a result of private initiative. These indoor events continued until the 1908 London Olympics. What is proving to be very difficult to find out is the date when the building ceased to be a gymnasium and what other uses it has been put to since. At the moment it is an “event space” and houses a moderately interesting exhibition about the development of the King’s Cross area. Somehow, an “event space” sounds anaemic and lacking in real activity, compared to the heroic history of this building. The other building visited by Tory Historian was the Highgate Literary and Scientific Institution, established in 1839 as a Mechanics’ Institute. These were founded, as every school child ought to know, by industrialists partly out of benevolence but more importantly and usefully, because of an assumption that a better educated work force was a more efficient one. Today the Institute building is made up of a couple of old cottages and an old stable yard, knocked together with an addition or two. It has a library, made up of the original 400 volumes and later additions, many of which, in Tory Historian’s opinion, are not what is required. All lending libraries have stacks of the latest popular paperbacks. Why does an institution whose space and, presumably, budget limited acquire them as well? We can be sure those Victorian founders did not think that housing popular novels was the purpose of the library of the Institute. There is, however, a large and comprehensive collection of books on London, old and new, and they also hold some of Coleridge’s and John Betjeman’s archives as well as the old Highgate archives. All the papers can be viewed on application. The Institute still holds classes, lectures, discussions on scientific subjects and film shows. Tory Historian was sorry to see that almost all courses are held during the day on week days, making it impossible for anyone with a job to attend them. Not, surely, what the Institute had been founded for. But the lectures, discussions and films shows are in the evenings. Today is the 300th anniversary of the birth of Dr Samuel Johnson, poet, essayist, critic, journalist, biographer, lexicographer and, above all, one of the greatest Tories. This is a preliminary posting, to remind readers of the event. There will be more. Tory Historian cannot let an anniversary like this pass by without writing a good deal on the subject. September 17, 1939 Soviet forces invade Poland without any declaration of war and quickly defeat the retreating army, taking many thousands of prisoners of war. A good many of them were subsequently "executed" in various camps. A delightful picture full of ironies. 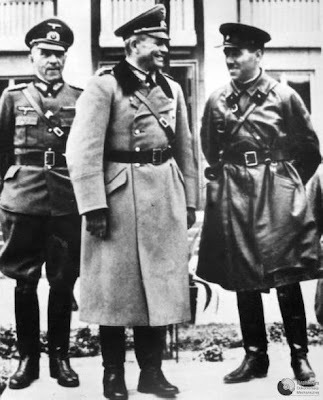 General Heinz Guderian, the outstanding German panzer commander shares a joke with the Soviet General Semyon Krivoshein at the joint parade held by the two invaders in Brest on September 22, 1939 (though fighing went on for some time longer). Less than two years later General Guderian led Panzergruppe 2 in Operation Barbarossa, rapidly capturing Smolensk and almost taking Moscow. General Kriovshein, who was actually Jewish, also fought in the Second World War, though first he fought against Finland. He was one of the commanding officers in the great Kursk tank battle and played a prominent part in the battle for Berlin. The man had a charmed life though, presumably, his Civil War service with Stalin's favourite commander, the less than talented Semyon Budyonny, stood him in good stead. Krivoshein survived the great purge of the army in 1938 completely unscathed and was not caught up in the second, largely anti-Semitic purge either. One wonders in what circumstances the two generals met again. David Low's cartoon sums up the situation. There is a posting in the pipeline (and what a painful position that is to be in) about Sir Jack Drummond, nutritonal scientist, public servant and historian of food in his ground-breaking "The Englishman's Food". In the meantime, as a link between the postings about the outbreak of World War II and the Drummond piece, here is a link to an article published in Time magazine about meat shortage and food rationing in Britain in January 1941. It talks about Lord Woolton, a man about whom Tory Historian will write again and describes the activity of that fairly repulsive journalist, William Connor a.k.a. Cassandra of the Daily Mirror. The story of him finding restaurants where politicians and others stuffed themselves while Lord Woolton cut the meat ration for everyone else is amusing in its consequence. One can't help suspecting that among the diners there were journalists, editors and friends of journalists and editors. Were they, one wonders, all that pleased by Lord Woolton forcing restaurants to abide by the rationing rules? Back on line and on my own computer. It is a matter for rejoicing but it does mean that there has been a serious gap in the work on the Journals. This will be resumed instantly but not all the articles that have been promised have arrived. I hope to see the missing ones in the next few days. Introduced by the great Alvar Liddell, the Prime Minister, Neville Chamberlain, announces that the United Kingdom and the British Empire are now at war with Germany. I am speaking to you now from the Cabinet Room at 10 Downing Street. This morning the British Ambassador in Berlin handed the German Government a final note, stating that unless we heard from them by 11o'clock that they were prepared at once to withdraw their troops from Poland, a state of war would exist between us. I have to tell you that no such undertaking has been received and that consequently this country is at war with Germany. It was not what he or most people in the country had wanted but it was what everyone had to face up to. Well, everyone except the CPGB, which continued its campaign against the war until June 22, 1941. The Conservative Party website is running a Conservative Party history week, which is to be welcomed, as too many members of the party have no idea of where they, as an entity, have come from. There is a short film about the party's development, concentrating on the progressive aspects, which is an important part of the history. There are also blogs that deal with various subjects that Tory Historian will probably fisk at some later stage.